Lyubimov A.P. 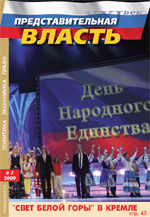 Review of a book “Contemporary Problems of Power in the World: Russian Approach” by V.N. Likhachev (Moscow: Veche, 2009).